It’s a bold title, but my husband and I are unanimous in thinking it’s accurate. Here’s the back story: I knew from our last trip to Paris with Chloe that she’d be welcome in nearly every café/brasserie/bistro/restaurant we took her to, but I also realized that Paris, like Seattle, would see a fair amount of rain during the month of October. 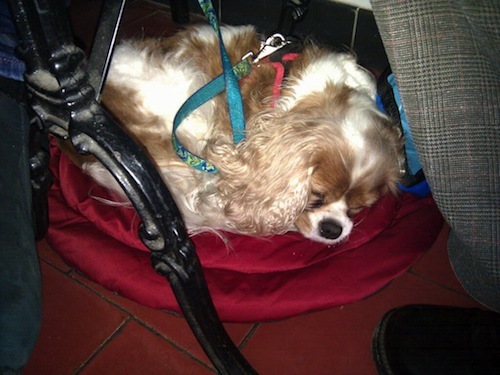 Chloe, who loathes the rain, might well balk at lying down on floors made wet by diners coming in from the weather. Also, she’s (sadly) not used to keeping us company while we eat out, so I suspected she’d do a better job of understanding the plan (curl up until we’re done) if we gave her a clear signal. What I wanted was a padded mat that could be compressed into a sack small enough to fit into, not take over, my purse. I had seen what turned out to be Ruffwear’s Highlands Bed at Seattle’s big REI store, and after a variety of missteps I got my hands on one again (FYI, REI now sells Kurgo pet products to the exclusion of almost any others). It was as I remembered it — machine-washable, water-resistant, and only lightly padded, so it compresses into a small stuff sack. Still, at 35″ x 26″, it was too large to fit under a Parisian café table (and the stuff sack was far too large for even my massive purse). I opted to cut it in half down the middle (dust off your sewing machine; sew two straight seams from one side to the other — parallel and about half an inch apart; cut between the seams; bind each resulting edge with zig-zag stitching). That left me with two semicircular (more accurately, semi-oval) mats, each a much more reasonable 26″ long and 17″ wide. 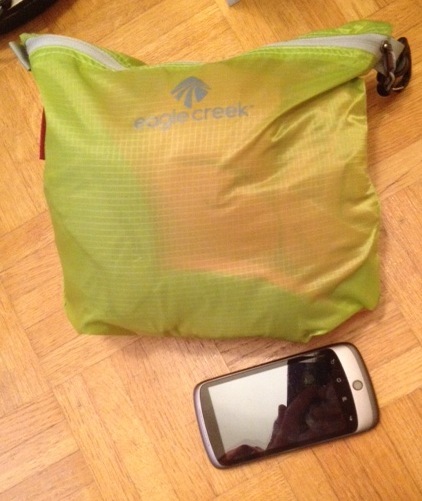 One of those mats squashes nicely into the middle-sized Eagle Creek Pack-It Specter Sac (I bought it in Strobe Green so I could find it easily in the depths of my purse — I like those sacks because they’re whisper-thin, but that also means that they can crumple into a corner). If you prefer not to commit to the 3-piece set, seek out a sack that’s about the same size (9.5″ x 7.5″, with a 2″ bottom gusset). When we arrive at a restaurant, I unzip the sack, shake open the mat, and deposit Chloe by it in one brief flurry of activity. The mat has been a smash success. Paris (and environs) has indeed been damp at times, and I’m confident that Chloe has appreciated having a dry resting spot. There’s just enough padding, too, to make lying on a tile floor, or the pavement, more appealing. She certainly heads right onto the mat and curls up. We’ve washed and dried it a couple of times now, with no ill effects. In fact, Chloe has yet to be turned away from any dining establishment we’ve taken her to — vive la France! An unexpected bonus? The same demi-Highlands Bed, folded in half, pads the bottom of the wire bike basket on the front of Paris’s Vélib’ bikes-on-demand, allowing Chloe to ride in comfort — more details in a later post! This really is the best dog travel item ever! We are from Seattle and do a lot of traveling as well and take our Boston terrier everywhere. This is perfect! Thanks so much for this amazing idea! So now there are three of us who agree, Abbey! 😉 Thanks so much for letting me know about your blog, too — it looks like a delight. Love this idea! 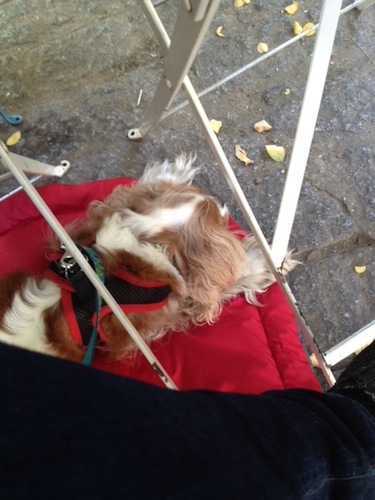 Here in L.A., land of outdoor dining, we actually have lots of restaurant patios where we can bring Wrigley along. Problem is, being outdoors, they’re dusty and dirty, and covered in crumbs. 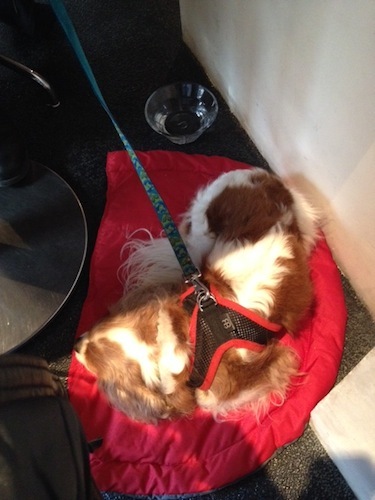 A little mat like this would be perfect to give him a clean, crumb-free space to snooze! Thanks for the tip. GREAT point!! I am so use to Monte on my lap (at 3.5 pounds) that it never occured to me that a mat would be a welcome, clever and needed addition to the packing list!